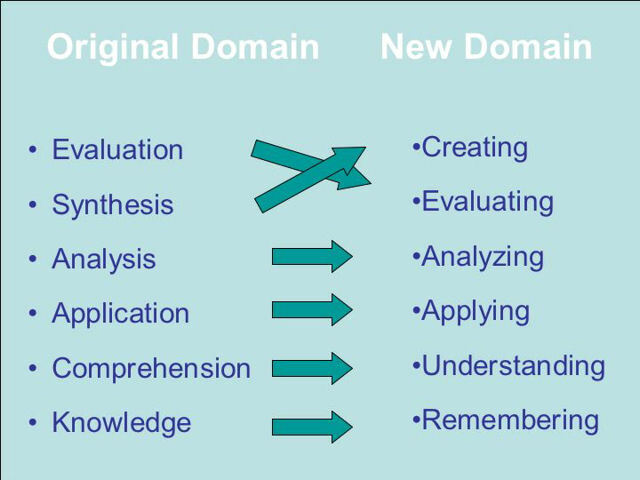 Bloom’s original taxonomy has been changed over the years. According to Donald Clark, the most significant changes were made by Lorin W. Anderson, David R. Krathwohl, Peter W. Airasian, Kathleen A. Cruikshank, Richard E. Mayer, Paul R. Pintrich, James Raths, and Merlin C. Wittrock in a book entitled A Taxonomy for Learning, Teaching, and Assessing: A Revision of Bloom’s Taxonomy of Educational Objectives. Several of the authors, Clark reports, had been Bloom’s students. He indicates that the most important changes the authors made included: Changing the names in the six categories from noun to verb forms; rearranging them as shown in the attached image; and creating a processes and levels of knowledge matrix. I like the fact that they changed the nouns to verbs and rearranged the stack to put creating on top of evaluating. Each of those verbs represents a skill that individuals need to survive and thrive in the modern world. The top four skills (i.e., applying, analyzing, evaluating, and creating) are skills that I believe are best learned by taking classes involved with science, technology, engineering, and mathematics (STEM). 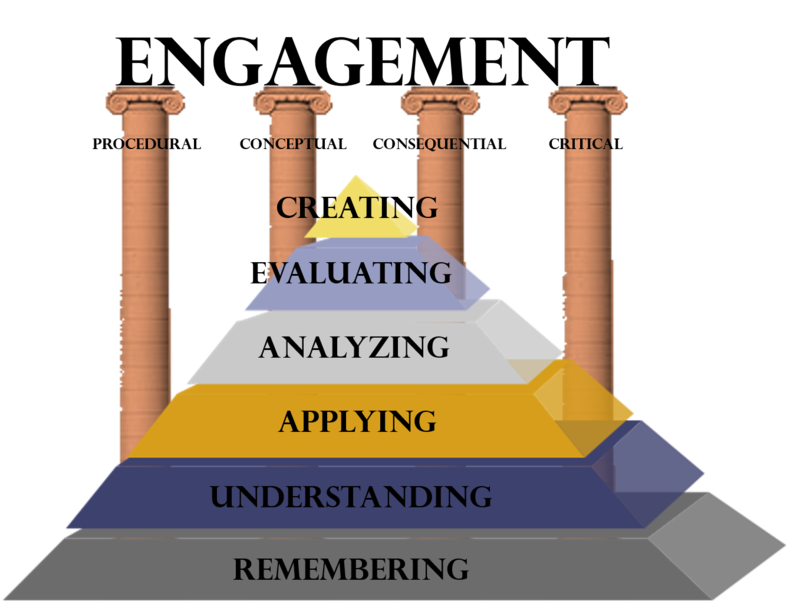 Although classroom work is important, I believe that real learning begins to take place when you get to the “applying” stage of Bloom’s Taxonomy. That’s why I, along with a few colleagues, founded The Project for STEM Competitiveness — to help get a project-based, problem-solving approach into schools near where we live. We firmly believe that by showing students how STEM subjects can help them solve real-world problems they will begin to appreciate the opportunities that STEM skills open for them. We are not trying to turn every student into a scientist, technologist, engineer, or mathematician; but, we are trying to help them understand how science and engineering methodologies can help them cope with the challenges they face throughout their lives. Those methodologies are what lift students beyond remembering and understanding to the higher levels of learning. Procedural engagement. Using procedures accurately, but without a deeper understanding of why one is performing such procedures. Conceptual engagement. Understanding why the concept or tool works the way it does, but with little appreciation for how to apply it in the world. Consequential engagement. Connecting solutions with implications, and recognizing the value of disciplinary tools to achieve particular consequences in the world. Critical engagement. Questioning whether the disciplinary tools being employed are appropriate for the particular solution in terms of the particular problem being addressed. “While procedural engagement involves knowing how to use procedures accurately, and conceptual engagement involves a deep understanding of a concept, consequential engagement involves actually being able to use the concepts as disciplinary tools to accomplish meaningful goals in the world — and critical engagement is about critiquing whether the conceptual tool is even appropriate. While procedural engagement can be useful for solving math problems, for example, the problem is that students can simply follow instructions, undermining ownership, learning, and even pride in what they achieved. Conceptual engagement has been shown to be effective for some students, but is less effective for students that need to see why the content matters. When a teacher organizes a unit around a big idea without consequential engagement it often runs the risk of simply being a theoretical exercise, with the bias here being that students will likely be more invested when the project is framed in a manner that supports consequential engagement. We all learn differently; which is why so many different teaching methods must be used to reach individual students. By understanding different learning frameworks, teachers and parents are better equipped to understand their students/children and select methods and techniques that promote the best kind of learning. In the end, however, students must be able to apply classroom lessons to real-life challenges if they are going to be successful. Donald Clark, “Bloom’s Taxonomy of Learning Domains,” Big Dog & Little Dog’s Performance Juxtaposition, 12 January 2015. Sasha Barab and Tom Vander Ark, “Learning for a Reason: 4 Levels of Engagement,” Getting Smart, 17 August 2015.